Scotch's flavor boundaries reach from the light and fragrant to the rich, powerful and smoky, touching every point in between. Its web of complexities is not made by a machine—the spirit is a living manifestation of a culture. New Zealand: A free chart offers an alphabetical list of all New Zealand wines reviewed for the tasting report in this issue. Spain: A free chart offers an alphabetical list of all Spanish wines reviewed for the tasting report in this issue. FREE: New Zealand Alphabetical Listing - More than 400 wines were reviewed for this report. A free alphabetical list is available. WineSpectator.com members can access complete reviews for all the wines tasted using the online Wine Ratings Search. WineSpectator.com: BONUS VIDEO Rich Reds of New Zealand: Most wine lovers think of the country for Sauvignon Blanc and Pinot Noir. But Cabernet and Syrah are on the rise, from the stony soils of Gimblett Gravels in the Hawkes Bay region of the North Island. Get to know the wines and region with Craggy Range's director of winemaking, Steve Smith. FREE: Spain Alphabetical Listing - More than 900 wines were reviewed for this report. A free alphabetical list is available. WineSpectator.com members can access complete reviews for all the wines tasted using the online Wine Ratings Search. WineSpectator.com: BONUS VIDEOS: Delve deeper into Spanish wine with two of the country's leaders. Mencía Madness: "Passionate" and "obsessed" start to describe winemaker Alvaro Palacios. After helping elevate Priorat to one of Spain's top wine region, he headed for Bierzo, a forgotten region in northwest Spain, where he makes brilliant wines from the Mencía grape. Rioja Rules: : Executive editor Thomas Matthews talks Rioja style with Victor Urrutia of CUNE, whose 2004 Imperial Gran Reserva earned Spain's first Wine of the Year, in 2013, from Wine Spectator. WineSpectator.com: BONUS VIDEO Meet Christophe Roumier as he and senior editor Bruce Sanderson explore the complexities of Burgundy. They look at the differences between two red wines, Les Combottes and Les Crau, from vineyards only 600 feet apart in Chambolle-Musigny. 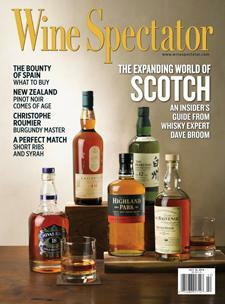 WineSpectator.com: Members can reference our full archives of Owen Dugan's columns and other articles on chocolate. WineSpectator.com: Build your cellar through smart bidding. Members can use our online Auction Price Database to track the performance of more than 10,000 collectible wines. Matthew Tropeano's Braised Short Ribs with Syrah - Chef Matthew Tropeano, Pain d'Avignon, Hyannis, Mass. WINE COUNTRY TRAVEL Autumn, amid the excitement of harvest, is a great time to visit your favorite region. Wine Spectator editors provide tips on where to stay, dine, taste and tour in places as diverse as Monterey on California's coast, Long Island's East End and Provence in Southern France. KOSHER PICKS One of New York's leading kosher restaurants shares a new recipe for the High Holidays, along with kosher wine suggestions to satisfy a wide range of tastes. VIDEO CONTEST FINALISTS Hurry—you have until Sept. 1 to submit an entry for Wine Spectator's Eight Annual Video Contest, with the chance to win fantastic prizes! Then, find out who made the cut and who won viewers' top vote to earn the grand prize! On Sept. 8, the finalists are posted and voting opens to the public; the winner is revealed on Sept. 16. Rich Reds of New Zealand: Most wine lovers think of the country for Sauvignon Blanc and Pinot Noir. But Cabernet and Syrah are on the rise, from the stony soils of Gimblett Gravels in the Hawkes Bay region of the North Island. Get to know the wines and region with Craggy Range's director of winemaking, Steve Smith. Cool & Crisp Aussies: As many Australian winemakers opt for crisp and juicy wines over the big and ripe style for which the country has been known, cool-climate areas such as Victoria's Strathbogie Ranges are hot. Check out the Strathbogie style of Chardonnay and Shiraz with vintner Matt Fowles. Pinot Style—Sonoma Coast vs. Valley: To demonstrate the impact of climate and soil, Three Sticks winemaker Don Van Staaveren compares two single-vineyard Pinot Noirs—one from Sonoma Valley and one from Sonoma Coast. READER POLL We want to know what you think about hot topics in the world of wine, from restaurant wine service to pricing to the latest trends in wine styles and grape varieties. Vote in our polls and see your fellow readers' opinions. LEARN ABOUT NEW ZEALAND Get to know key growing regions and taste the distinct wine styles with Wine Spectator School's online course on Australia & New Zealand. This and nine other courses are included with your WineSpectator.com membership.